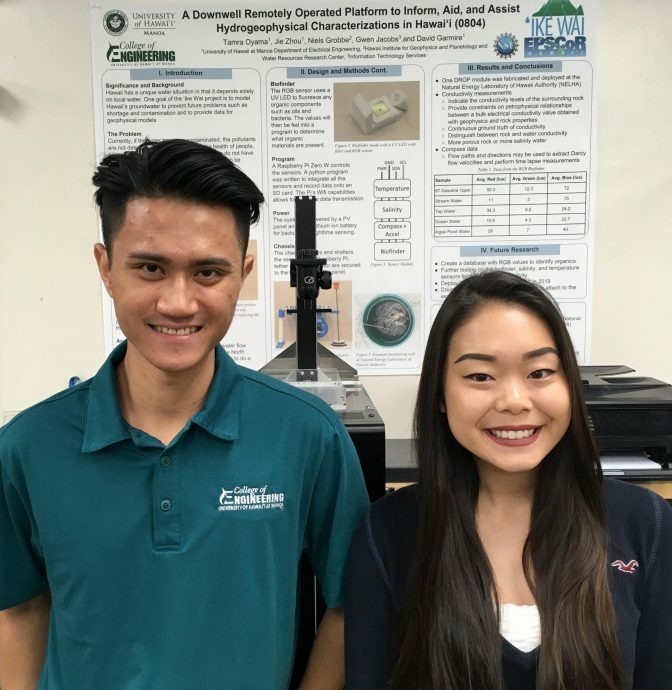 (Hawaii)– Students in the University of Hawaiʻi at Mānoa College of Engineering have developed a small, four-sensor, solar-powered device that could transform well-water monitoring throughout the Hawaiian Islands. Tamra Oyama, a graduate scholar and graduate engineering student in the ʻIke Wai project is leading the effort to develop the Downwell Remote Operating Platform (DROP). By cost-effectively measuring four critical aspects of water quality–temperature, flow direction, salinity and biocontaminants–the DROP module provides a rapid, simple and environmentally sustainable way to remotely and wirelessly monitor well water within the islands. Currently, the DROP module is being tested in its prototype phase in wells at the Natural Energy Laboratory on Hawaiʻi Island. Long-term goals are to expand the DROP module’s use to the other islands and beyond. ʻIke Wai, funded by National Science Foundation’s Established Program to Stimulate Competitive Research (EPSCoR), seeks to better understand Hawaiʻiʻs aquifers. The information collected from the DROP sensors helps the project’s researchers and community members with valuable data for decision-making. Working with David Garmire, ʻIke Wai researcher and associate professor of electrical engineering at UH Mānoa, Oyama joined the project in fall 2017 when she worked on one of the device’s sensors as an undergraduate. Assisted by fellow engineering graduate student Jie Zhou, Oyama oversees DROP module development in the UH Mānoa Fabrication Lab (FabLab), where more than 15 undergraduates work cooperatively within the lab space. The FabLab provides a collaborative learning environment for students to create, design and fabricate sensor modules and other engineering projects using 3D printers and other advanced technologies. Oyama sees her team’s efforts and hard work benefiting Hawaiʻi’s long-term water future. With the low-cost, self-sustaining water DROP monitoring system, she and her team hope to reduce costs and the need for manual labor, so that well-water monitoring will become safer, more accessible and easier to conduct. “The DROP module’s ability to cost-effectively monitor water quality will give scientists and the general public knowledge of our water like never before,” said Zhou. Oyama and Zhou stress that the device can be upgraded easily, so other water quality indicators could be added on later, as needed. During its development, a new way to make electronic polyvinyl chloride chips using 3D printers was discovered, and Oyama will be publishing a paper on those findings.